If you want the best Persian cat food bowl for your furry companion, this comprehensive guide is all you need to save both time and money. We gathered all the info available to make sure the products we offer you as buying alternatives are sturdy and safe for pet use. Moreover, we analyzed plenty of expert reviews and honest opinions from cat lovers so you won’t waste your money on something that is cheaply made. One model that seems to be loved by both the owners and their companions is the Trendy Pet Whisker. The unit is crafted from BPA-free plastic and has a unique feature that will prevent food spills. Besides being durable, the product is also easy to clean and microwave safe. If the alternative is out of stock, the FelliP Oblik Bowl can be equally exciting and helpful in keeping your cat happy. An elegantly designed food bowl that can fit beautifully into your stylish kitchen, this product is made to improve your pet’s eating experience. Because of its size and the ceramic material used, this bowl reduces the possibility of whisker stress for your cat.This product is also both dishwasher and microwave safe, as well as water resistant. Some buyers have complained that the food bowl is a little too heavy and large, making it more difficult to transport from one place to another. If you’re looking for a stylish, yet durable food bowl that will reduce your cat’s whiskers stress and fatigue, there aren’t many better options than the Trendy Pet Stress-Free. 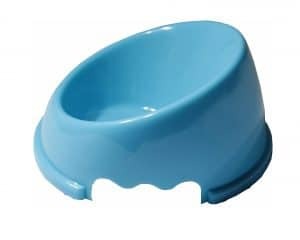 This bowl comes with a non-slippery base and slanted shape, which will not only improve your pet’s eating experience, but it will also encourage a healthier and easier food posture for your cat. Its shallow design is specifically made for flat-faced cat breeds with whisker stress. This product is dishwasher safe but it can also be cleaned manually with a sponge. Because of its dimensions, this food bowl might be more appropriate for slightly larger cats, rather than baby cats or smaller pets. Made from non-toxic acrylic material, the Fellip Obliq Pet food bowl is a great option if you’re looking for an easy-to-clean bowl to improve your cat’s eating posture and reduce whisker stress. The makers of this food bowl branded it as ‘interactive’, which means that, thanks to its design, the meals will fall towards the center, preventing any overflow. This makes it a great option for squished-nose pets and messy eaters. The bowl’s grip opening and the thick layer of plastic it is made of make it both safe and easy to transport. Despite its sturdiness, some customers complained that the bowl is still too light, sometimes causing the pet to chase it while eating. With its ingenious design, this Love “N” Creatures mess free pet food dish might be what you’re looking for if your cat is usually a messy eater that leaves food waste all around the bowl. Finding that perfect, meet-all-needs bowl for your cat might prove to be more than a simple shopping session given the various aspects you need to keep in mind when purchasing a cat bowl. Trendy has considered all those aspects when creating this model. From reducing your cat’s whiskers stress and fatigue by providing a wide, shallow, ceramic dish, to offering a durable and resistant product perfect for long-term use, this bowl might be just what you need. The stylish design will add a touch of exquisiteness to your kitchen while the materials it is made from make it both dishwasher- and microwaveable-safe and easy to clean if you opt to wash it manually. The product uses BPA-free plastic, which makes it safe for your pet. Most customers who’ve tried it appreciated the bowl for its artful design, sturdiness, and the fact that it is easy to clean. Whisker stress is caused if a cat’s sensitive whiskers touch the sides of the bowl. This bowl from Trendy Pet will improve your cat’s eating experience by reducing whisker stress thanks to its size and the ceramic material used. The bowl is both dishwasher- and microwave-safe. It is also water-resistant and easy to clean. The Whisker Stress Bowl uses BPA-free plastic and is rot resistant and sturdy, which means that it won’t split or delaminate like wood. The bowl features a stylish design that will complement your kitchen and add a luxurious feel to your cat’s eating time. The product measures 8 x 5.5 x 4 inches and weighs 2.4 pounds, which might be too large for some customers and even a bit heavy to be carried from one place to another. This product is for people who have a taste for futuristic design. 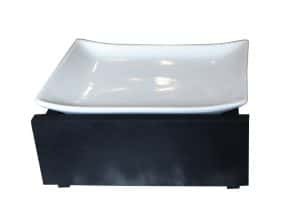 Its base is covered with a non-slip material, thus preventing the animal from physically chasing the bowl through the room while taking its meal. The product is designed to be dishwasher safe, although its design makes it easy to clean it manually with a sponge, as well. 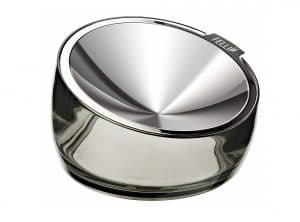 The FelliP Oblik Pet Bowl is made from a non-toxic acrylic material, with high-quality stainless steel, which ensures feasibility and a long life. The shallow design is made to avoid whisker stress. In addition, the product was created to make a good choice for owners who strive to keep their animals safe and healthy. The shallow bowl comes with an elevated integrated support, which ensures a comfortable and healthy position of your cat during meals. It is common for animals to develop joint problems when they reach old age because of the unhealthy position they used during meal time. Also, the elevated integrated support ensures a good condition for easy digestion. The non-slip base of the bowl will improve your cat’s eating experience by preventing the dish from moving and, thus, your pet from physically chasing the bowl while eating. Thanks to its slanted shape, the bowl encourages a healthier and easier food posture for your pet. The elevated integrated support ensures a good condition for easy digestion as well. The shallow design reduces whisker stress and fatigue. The product is made from non-toxic acrylic material and high-quality stainless steel, which ensures long-term use. 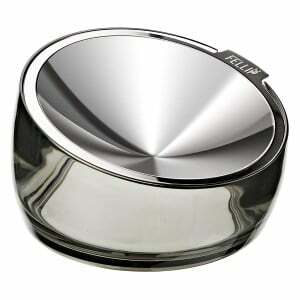 The FelliP Oblik Pet is dishwasher-safe but it can also be cleaned manually thanks to its simple and practical design. Some customers found the product a bit large and bulky for their cats, which means it might not be ideal for baby cats or smaller pets. Dry food might end up on the floor, which makes it more suitable for wet or canned food. This bowl is designed to be interactive and easy to use, both for you and your animal. Its intuitive shape makes it easier for the food to remain in the center, therefore preventing slipping off and to the edges, which makes the meal more pleasant for your pet. The model has a grip opening, which makes it easier to take it off the floor whenever you have to clean it or fill it with food. The angled model allows your pet to eat without getting its face messy, and this feature prevents whiskers fatigue as well. Because of its design, the product can be carried around when you’re traveling without taking too much space. Its sturdy resistance recommends it both for travel and home use. Because it is made of a thick layer of plastic, it is safe for transportation. Additionally, the product’s design recommends it for home use in the case of people who have more than just one pet. Due to its angled shape, the bowl prevents the food from overflowing by making it fall towards its center and your cat from getting a messy face and whiskers fatigue. The angled model is ideal for messy eaters or squished-nose animals which have a hard time in getting the meals left in the corner of the container. The small size also makes it perfect for placing food or water into a new cat carrier. The bowl design will not only reduce food waste but it will also improve your cat’s overall eating experience by eliminating any food-chase stress. The thick layer of plastic it is made of makes the bowl safe for transportation. The grip opening ensures easy lifting off the floor and the sturdy materials used make it perfect for both home meals and travels. Some customers still found the bowl too lightweight, which might end up with your cat chasing it while eating. Due to its size, the bowl might be more suitable for smaller cats. This product is a two-piece set, designed to be functional before everything. The two bowls are made of plastic, but they do have an excrescence on the bottom to prevent them from getting glued to the floor. The design is in the shape of a cat’s head, and it comes in different colors, which makes it great for a homey place with a cozy personality. 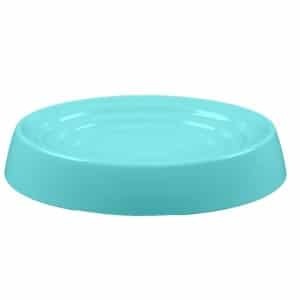 The bowls are ideal for wet food, water, and dry food as well, due to their size. In an attempt to avoid overfeeding, these bowls have the capacity of the recommended amount of food that a cat should generally eat. The set measures 5″ L x 4.75″W x 1.5″H and can be easily accommodated anywhere in your home. Usually, cat food is kept in the kitchen, which could make it easy for you to match the color of the set with the furniture. It can be easily washed in the dishwasher, but placing it in the microwave is not recommended. The set includes two pieces that are perfect for feeding two pets or dividing the food for a single furry friend. The material used is plastic, which makes the two pieces resistant and durable. They feature an excrescence on the bottom that stops them from getting glued to the floor. The cat-shaped design will suit the home decor of a cat owner and lover who is proud of showing his or her special relationship with this furry friend. Due to their size (5″ L x 4.75″W x 1.5″H), the two bowls are ideal for water, wet and dry food, and can be easily accommodated anywhere in your home. The shallow depth prevents whiskers from getting in food or water. The bowls are dishwasher-safe but they can also be cleaned manually with ease. The bowls cannot be used in the microwave. This product is a good solution when it comes to kitten bowls. 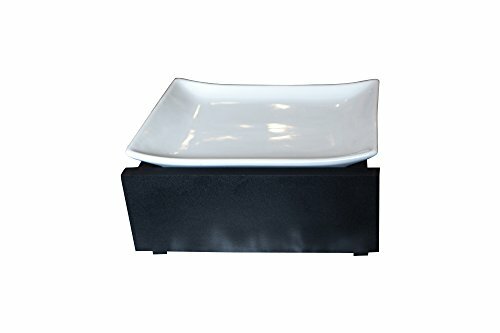 The dish stand contains two separate bowls, which owners can use for either water, wet food or solid, dry food. The set comes with a multi-size can cover, which is made of a universal lid with different size-cans on its interior that allow it to cover food that comes in various packages easily. The set is made of an anti-skid material, with a silicone bowl placement that is designed to prevent the food from sliding out of the container. The set is dishwasher safe, which makes it perfect for people who lack time to clean the product manually every day, preventing it from storing leftovers and becoming insalubrious. However, for people who prefer to wash it manually, the cleaning process is made easier, as the set is made from material which can be easily cleaned with any sponge. In addition, the product is environmentally-friendly, made of silicone. Thanks to the two bowls the dish includes, this product can be used for wet food and dry, solid food. It is, thus, perfect to keep all the food your cat needs in just one place. The multi-size can cover the set comes with features different size-cans on its interior and is perfect for covering food coming in different packages. Due to the anti-skid material used and the silicone bowl placement, the dish will prevent the food from sliding out of the container reducing thus food waste. The product is dishwasher-safe but it can also be cleaned manually with a sponge thanks to the material and design it features. Some customers argue that the bowl is a bit flimsy and lightweight, which might make it easy for bigger cats to turn it over. Its size makes it more suitable for smaller cats or kittens. The many aspects one should keep in mind when looking for an excellent cat bowl might turn one’s shopping session into a real adventure. Not if you opt for this Wide Mouth Flat Cat Bowl from Super Design. The product was designed to meet a cat’s needs while remaining stylish and durable. The wide mouth of the bowl is meant to improve your cat’s eating experience by providing it with enough space and offering access even to older cats. The stable design prevents the bowl from tipping over and thus reduces food waste and messy faces. The bowl is dishwasher-safe and the tough material it is made from provides its durability. It also features four feet that will prevent the bowl from moving and thus your cat from chasing it while eating. Most people who’ve tried it have good things to say about its design and resistance. This wide mouth bowl will improve your cat’s eating experience by offering more space and thus make it easier for you to fill it in with food for two or even more meals in case you’re often outdoors. It offers easy access even for older cats and it’s a perfect slow-feed bowl. The product uses a tough dishwasher-safe material that can hardly be broken. It comes with four feet that will keep it in place and prevent it from tipping over. 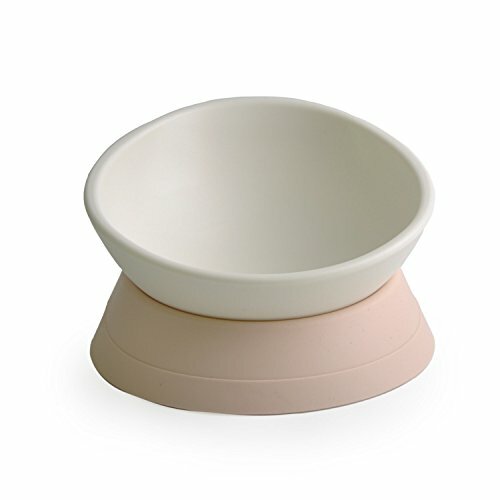 The bowl features raised lines that will help you distribute your cat’s various foods evenly. It measures 4 x 5 x 1.6 inches (S size) and 5.7 x 4.7 x 1.8 inches (M size), which makes it easy to carry and move from one place to another. Some customers might find its size not generous enough for large food portions. However, the bowl is available in both S and M sizes. A cat’s eating time might easily turn into the definition of a mess. The rebel personality of a cat combined with a too light or slippery bowl might end up in food reaching unwanted places and your cat’s lingering hunger even after there’s no food left in the bowl. This bowl has been designed to make sure you and your cat doesn’t get to experience all of the above. Designed to protect your cat’s cervical spine by allowing it to adjust its food posture, the bowl won’t just help your cat enjoy the meal but it will also reduce food waste by preventing it from slipping over. Its weight adds to the anti-slip feature. The high-quality resin materials used are free of toxins, eco-friendly, and safe for your pet. The durable and wear-resistant materials make it ideal for long-term use. Plus, the stylish design makes a great addition to one’s kitchen décor. 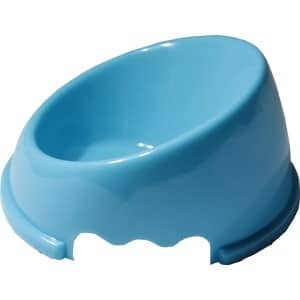 Thanks to its design, this flat face bowl for pets can be arbitrarily placed and, thus, allows your furry friend to change its eating position. It is designed to protect your cat’s or dog’s cervical spine. Plus, it reduces food wastage. It uses high-quality resin material that is eco-friendly and free of toxins, which makes it 100% safe for your pet. The durable material ensures long-term use without breaking. 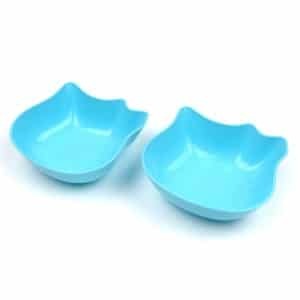 The base of the product comes with increased elasticity, the bowl being anti-slip, anti-friction, and anti-bite and also firmly placed. It can be easily cleaned and wear-resistant at the same time. The product measures 6.3 x 4.2 x 6.7 inches and weighs 13.3 ounces, which might be a bit too large or heavy for some customers. However, its dimensions and weight make it stay firm and prevent it from being slippery. Are you an owner of a flat face pet in need of that one perfect bowl to match your pet’s eating needs? You might want to check this model from iBard. Flat face pets have different needs and, thus, their food bowls should be designed to meet their needs. Here is where the Dual Purpose model comes into sight. Designed to put your pet at ease when eating, this bowl features a quality 360-degree free tilt design that allows the pet to adjust its eating posture and adopt the best position for its physiognomy. 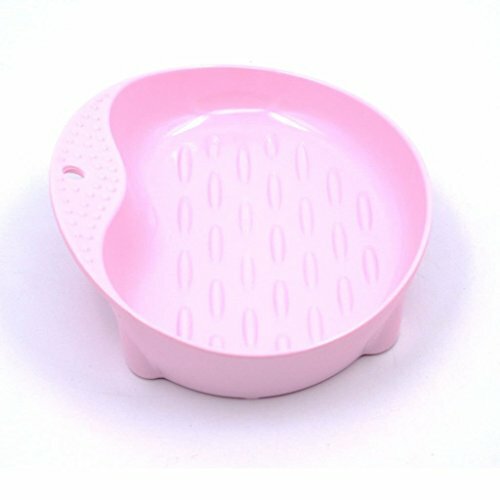 Moreover, this is one of the most popular raised water bowls for cats, and it will stop the food or water from spilling by keeping the contents at the center. The product is made from quality resin materials that are free of toxins, therefore, you don’t have to worry about any safety issues. The stylish design will add to your kitchen décor and its resistant materials are perfect for long-term use. The product features a stylish design that offers flexibility when eating, encouraging different eating positions and protecting the pet’s cervical spine. The 360-degree free tilt design will, thus, allow the pet to adjust its feeding posture. The product also reduces food waste thanks to its raised bowl. Spilling is prevented as the food falls towards the center of the bowl. It ensures a great way to feed your cat both comfortably and hygienically. It includes the food bowl and the bottom base, which makes the product easy to be cleaned. The high-quality resin materials used are 100% safe, free of toxins, and eco-friendly. The product is resistant and durable as well. The food bowl has a capacity of 8.5 oz that suits the needs of a pet less than 25Lbs. Thus, it might not be large enough for bigger pets. However, its dimensions make it easy to be carried from one place to another. Not all food bowls out there are your friends. When choosing the correct one, the most important feature to look at is the size. On one hand, you would like to prevent your animal from overeating because most of the digestive diseases among cats are mainly caused by overeating. On the other hand, if you’re the type of person who travels a lot and is away most of the time, you wouldn’t want your animal to starve, and it is best to have an option to leave it more food at once, assuming this is something that happens once in awhile and not on a daily basis. Additionally, it is also important to consider how many pets you have when choosing the size of your product. While you may feed two cats in different bowls, they will occasionally eat from each other’s plates, which makes it recommended to have a slightly bigger place to put their food in. If you’ve just adopted an obese cat, it falls under your responsibility to control its dietary habits. It is not uncommon for formerly stray cats to have a tendency to overeat in compensation for the times when meals were not a certainty. However, you should make sure that you feed your animal proper dietary meals, while also avoiding oversized portions. Secondly, design matters. For once, due to the fact that most of the digestive problems in cats are associated with poor positioning during meal times. You may want to make sure that the product’s design is intuitive enough for your animal not to have to sit in an uncomfortable position. This wouldn’t only affect its joints, but also the digestive system. In the long run, functionality wins the race. In addition, to make sure that your cat won’t get food all over its face and whiskers, you should pick a product that has an intuitive design and a shallow shape. When picking a product for our pets, we should always keep in mind to take care of our needs as well. For instance, if you don’t have the time to do the dishes manually, maybe it’s time you looked for a bowl that is dishwasher-friendly. Or, if you travel a lot, you should consider a collapsible bowl. But there are other aspects to take into account as well. If your interior design is unitary and it has a powerful personality, you should do your best to match your animal’s products to your home. If your house is decorated in a Scandinavian manner, you wouldn’t want to place a neon green bowl right in the center of your kitchen. Initially, this aspect may not seem important. But consider this: when you see an object every day, you want to make sure it is pretty enough for you not to get tired or annoyed. This way, you can prevent yourself from purchasing cat products every two months. The majestic Persian cat is one of the best-known and appreciated breeds in the world. 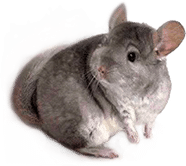 Its elegant appearance, beautiful fur, and flat snout, along with an affectionate personality are the qualities that make this breed such a loved one. Given that it has so many characteristics, the Persian cat needs special attention and everyday caring rituals in order to live a healthy and happy life. This goes from maintaining its beautiful fur to choosing the right food bowls. 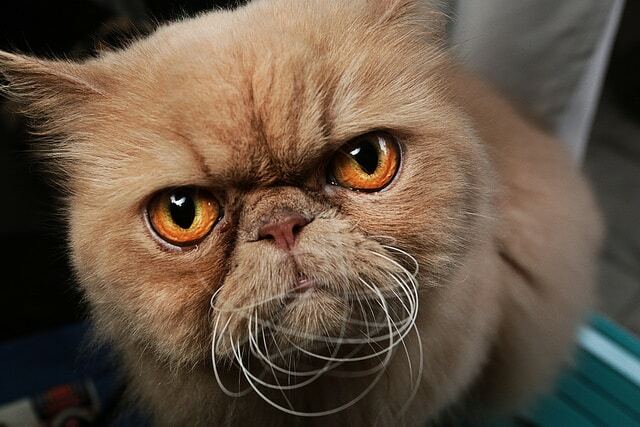 Here are some things you should know if you consider bringing a Persian cat into your life. 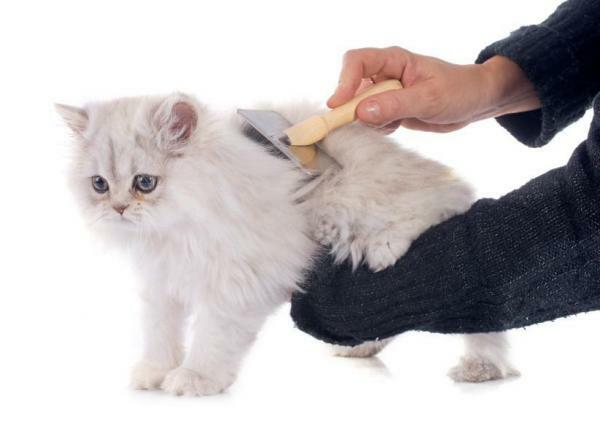 The Persian cat’s fur is long and beautiful, but in order to remain like that, it needs to be brushed daily. You can either choose a flat brush with plastic bristles or a metal one with round spikes which avoids damaging the pet’s sensitive skin. You might want to get your cat used to daily brushing from a young age, so that it becomes a moment of relaxation and care, as well as a bonding opportunity for you two. The brushing ritual is something that needs to be done but it can also be a moment you create together. 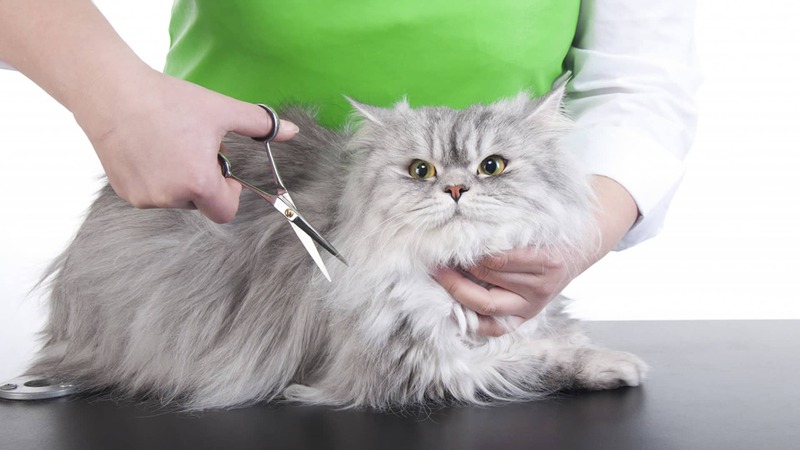 If daily brushing is skipped, knots and tangles will appear in the beautiful coat, and dead hair will not be properly removed. In a worst-case scenario, this can lead to hairballs getting stuck in the intestinal tract which can quickly become a medical emergency. The eyes need special attention as well, because the breed’s flat snout leads to having teary eyes. The tears needs to be cleaned every day with a soft cotton pad or a tissue dipped in water. In order to properly do this, place the pad just below the tear duct and the inner eye, gently removing all the secretions. Change the pad for each eye to avoid any potential contamination. If this cleaning is not performed daily, the lacrimation will build up and form a scab. This will be much harder to remove, especially without irritating the eyes and the tissue around them in the process. A Persian cat’s ears can accumulate more or less earwax depending on each individual and on the environment. It is advisable to clear the ears weekly, which prevents mites and bacterial infections. You can use a soft cotton pad for the external surface, and a swab for the grooves, but never enter the ear canal. If in doubt, you can always ask your vet to help out with this delicate procedure. 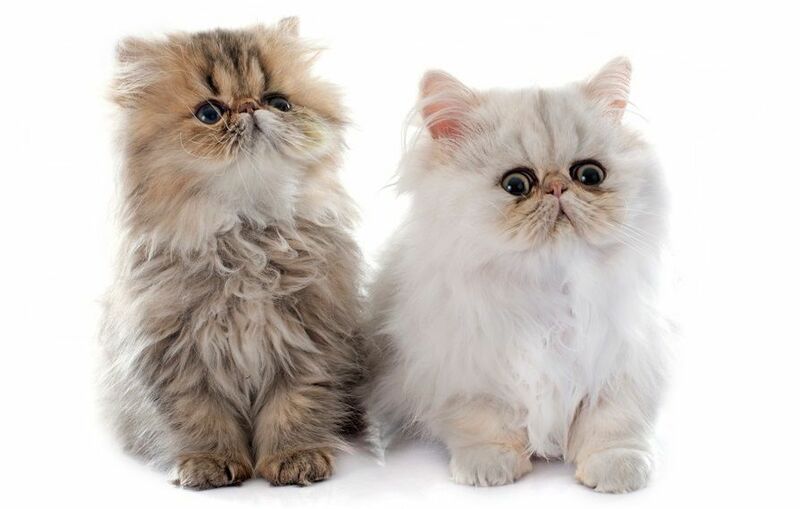 Given the breed’s flat face and short nose, you might want to look into special bowls for Persian cats. These should be as flat as possible, with low to no sides. If you choose a plastic one, the material can harbor bacteria, so a glass, stainless steel or ceramic alternative might be better. In case you choose a ceramic model, be careful if it chips, as bacteria can accumulate in those areas as well. This product comes in two different forms: oval or round, depending on your preference. The bowl is designed to avoid whiskers fatigue, ensuring a happy meal for your animal. The shallow form prevents the animal from being stressed out during the meals because of the slipping. Its design uses a non-slip mechanism, through the design that uses tiny ripples in order to prevent the food from sliding over to the edge of the bowl. The product is practical, and it is made from BPA free melamine, which recommends it for kittens because of its non-toxic, non-allergenic compounds. 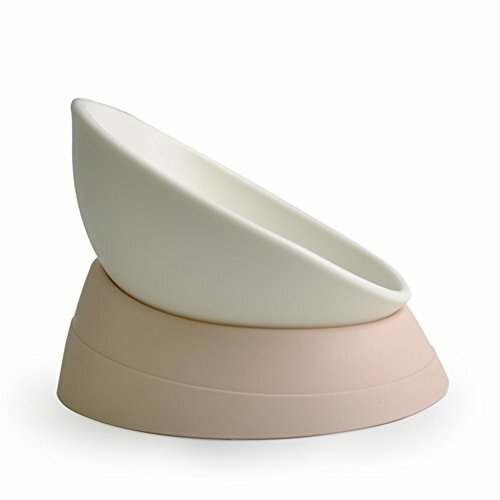 The bowl’s capacity is 4.5 ounces, which recommends it for healthy feeding. The capacity is the indicated amount of food for a normal-size cat, which prevents the owner from overfeeding the animal through oversized portions. The product is resistant to breakage, but it cannot be used in a microwave. The product was designed through rigorous testing by cats of different breeds and ages.